Nothing beats a traditional family Christmas spent unwrapping gifts, playing parlour games and sitting around the table for lunch. As we get older, many of us find it difficult to make it back home for Christmas due to work, distance or other commitments. Whether your family Christmases were spent peacefully or in total chaos, they will often be some of the happiest memories from your childhood. 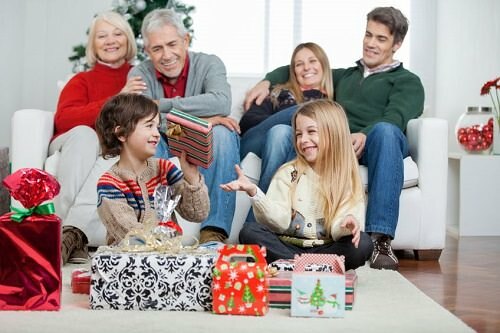 The following list gives 10 reasons why you should consider spending Christmas with your parents. Everyone loves feeling like a kid again, and waking up in your childhood home on Christmas morning will fill you with the same excitement you experienced as a child. Allowing your parents to wait on you hand and foot whilst you sit back and gorge on festive treats is another benefit of staying home. Celebrating Christmas at home is a nice opportunity to recollect family traditions and enjoy your childhood memories. Ask your mom to prepare the traditional meal you used to cook each year, decorate the Christmas tree as you did in childhood. Don’t forget to prepare heartwarming gifts for your loved ones.